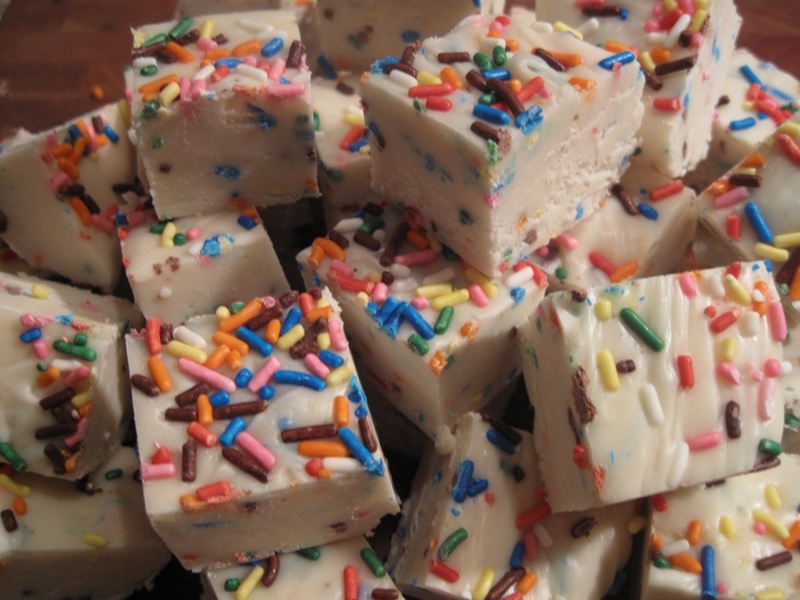 Yesterday I mentioned my new creation – my own FrankenFudge – Vanilla Ice Cream Cone Fudge. Today, I unwrapped the 2-pound solid block to see how it developed. Amazing. Just amazing. 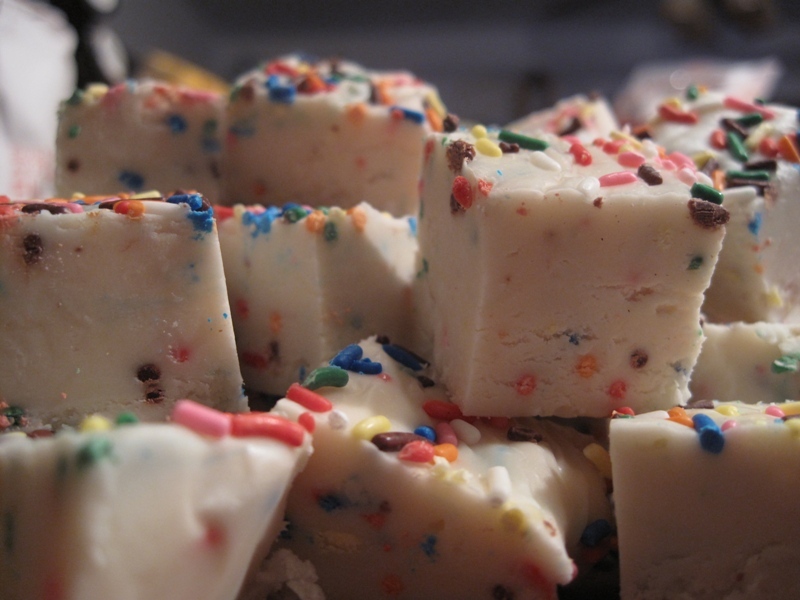 It tastes exactly liked I’d hoped – a creamy vanilla, laced with the waxy, sugary goodness of rainbow sprinkles. The sprinkles were evenly dispersed throughout the fudge, giving the confection it a carnival-like appearance, evoking images of hot summer days, licking dripping vanilla ice cream and errant sprinkles from my hands, which are greedily clenched around a squat crispy wafer cone. That’s great, I love how festive the fudge looks. That’s going to make nice fudge for gifting. 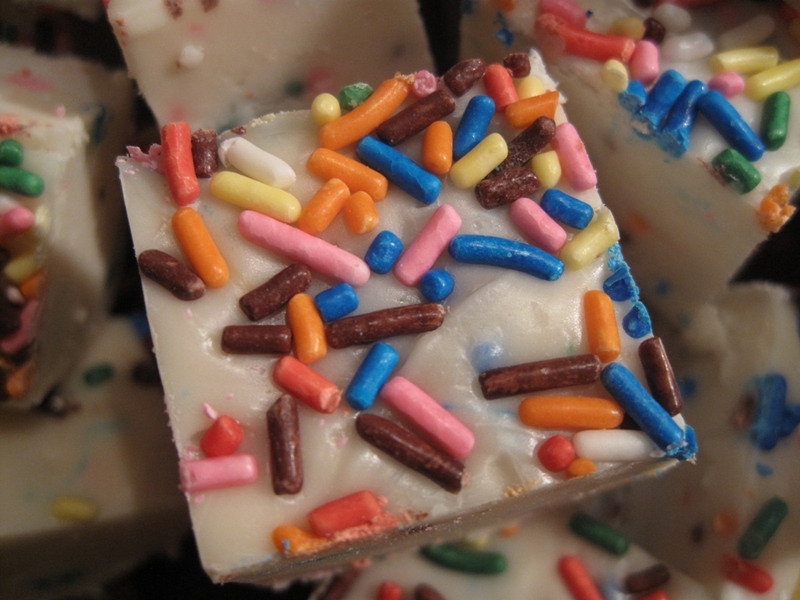 Care to share your fudge recipe? Combine butter, salt, sugar, and milk in heavy sauce pan; bring to a boil, stirring constantly. Boil for 4-5 minutes, stirring constantly. Remove from heat; stir in remaining ingredients, stir vigorously until combined. Pout into foil-lined 8×8 baking dish. Sprinkle with topping if desired. Allow to cool and set in refrigerator. If it tastes as good as it looks you could make a mint on it! No, thank you. I don’t like mint. I like that the recipe is adaptable, now you don’t take the temp? You just time yours? What heat are you cooking at? Electric or gas? I made some pumpkin fudge this fall that was amazing but it looked softer than yours. I like the texture (at least from the look of it) of yours. No, no thermometer. Medium-high heat, pretty good boil for 4.5 minutes. I guess it would bring it to the soft ball stage, but I never actually measured the temp. I think the marshmallows are the key ingredient to keeping the recipe so simple and preventing the crystallization that ruins candy. I’ve been using the same recipe for more than 10 years, and it hasn’t failed me yet!